It's been an eventful couple of months! The last time that I wrote, it was to send you a wedding announcement. On April 1, 2018 I married my childhood friend, and long-time sweet heart, Rodelyn Calas. Because of the health issued he developed from his years of service in missions, my Dad can no longer fly. We missed him very, very much! By God's grace, my Mom was able to come, however. The last week of March I picked her up in the capitol city of Manila. Three of my close friends from AFM, Dale and Leticia Goodson, and Laurence Burn, were already flying to Asia for meetings, and they were also able to stop by on their way. They stood in as my family, and I was so very happy that they were able to be there. On the way down from Manila, we stopped by the Adventist University of the Philippines, and picked up Rodelyn, and our adopted daughter, Ellen Joy, along with all of my native students who are in school there. That weekend was Easter weekend, the biggest holiday of the year in the Philippines. When we were finally able to work our way through traffic to the port, we found the line of vehicles several kilometers long. We waited for a couple of hours, until a kindly official finally told me that all those vehicles were waiting to go to a different port on the other side of our island. We could go to the head of the line, and within another hour we were on our ferry. The Alangan traditionally get married by having a series of spiritual ceremonies involving the families of the bride and groom. They consult the spirits to see if anyone in the spiritual world is angry at the marriage, and if there will be any negative consequences. Then a chicken is killed to the spirits, and the blood is put on the new couple. Obviously we couldn't use that traditional form of marriage. Besides, few Alangan use it anymore either. Most in our area have adopted the lowland Filipino custom of having an all-night dance, involving all sorts of debauchery. We weren't interested in that sort of wedding either, but we wanted to honor both of our cultures and heritages. What we decided to do was to use the traditional Western wedding as a base, and add some other elements to serve as new ceremonies that are distinctly Alangan in flavor. 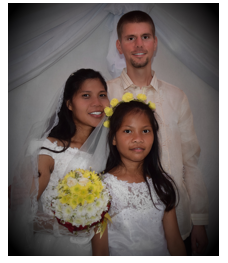 We wanted the wedding to be a wholesome example to the people, of how an Alangan Adventist can get married. We also wanted to fill in come cultural holes that had been left from abandoning the old ways. To start off with, Sabbath night we began the festivities with a huge game night. Whereas the usual dance only allows the young, unmarried folk to participate, at our game night everyone from the little kids all the way to the grandparents joined in. 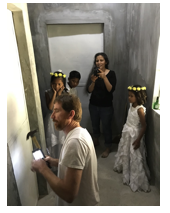 There were traditional chants, games mimicking the traditional work of the Alangan, and even a piñata that Dale and Leticia made out of an old cardboard box and some plastic. The kids got so excited over the piñata that we had to cover our ears to keep from losing our hearing. The next morning, when I went to take my shower before the wedding, I found that I couldn't get out of the bathroom. Something was wrong with the door knob. I calmly finished my ablutions, then quietly asked for someone to help me. At first Dale and my groomsmen didn't believe that I was really in trouble. Thankfully we were able to pick the lock, and I got out safely. We laughed about how it would have been funny if I had missed my own wedding because I got locked in the bathroom. "Should break the lock so it can't happen again?" Dale asked when I got out. "I think we we're about ready for the wedding," I replied. "Let's not worry about it till later." Almost as soon as we had turned around, though, Rodelyn and her mom went in the bathroom. Of course the doorknob stuck for her too, and they started knocking on the door asking for help. This time Dale had to saw the door knob off in order to get them out. We both agreed that it was time to make sure that the door wouldn't get stuck again. As soon as Dale turned to get a tool, though, our adopted daughter, Ellen Joy, popped into the bathroom thinking that the door was all fixed. This time it stuck so fast that Dale had to completely remove the locking mechanism, and leave a hole in the door, in order to get Ellen out. Within an hour's time, the groom, the bride, and then their adopted daughter had all gotten locked into the bathroom, on their wedding morning! Good memories! The wedding itself was much like a traditional Western wedding. We threw in a few changes, though, as part of our Alangan culture. Both the groom's family and the bride's family gave away their children. Then the in-laws exchanged gifts as a symbol of the uniting of the two families. After the pastor's homily, Rodelyn and I sat down, while all of our respected elders and, "second parents," gave us advice. Dad sent a letter which the Alangan church leader, Ramon, read to us. It brought tears to our eyes that he couldn't be there in person to deliver his council. 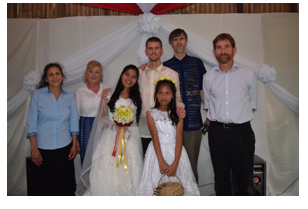 Rodelyn and I exchanged vows in the Alangan language, while Ellen Joy stood by. Then our parents, and everyone in the extended family gathered around, laid their hands on us, and the pastor prayed over us. And we were married! During the service it was difficult to count how many people attended. At the reception, though, it became clear than nearly one thousand guests came, from all over the Philippines, and of course, as far as America. For as simple and inexpensive as we kept the wedding, it was probably the biggest wedding that we have ever had in this area. Comparing notes after the wedding, Rodelyn and I both had felt God's presence especially strongly during the week leading up to the wedding, and even more during the wedding itself. Often time, even missionaries feel far from God, and we question why we so infrequently sense His presence. God's special wedding gift to us was an all-pervading sense of His presence, love, peace, and approval. There never was a better wedding gift! Rodelyn had to go back to college only one day after the wedding. We plan to have our honeymoon here on Mindoro next week when she finishes her last requirements for the semester. She will take off this summer for us to be together, and when she starts school again in August I will visit frequently. Because she recently switched courses from Nursing to Education, few of her classes transferred over, and she will have several more years of school before she graduates. When she and Ellen Joy are able to get visas to go to America, we plan to have a second wedding service in the USA. We want to celebrate the American half of our culture as much as our Alangan half, and we especially want to celebrate together with our friends and family on that side of the ocean. Thank you so much for your continued prayers, interest, and support! Rodelyn, Ellen Joy, and I strive every day to be more useful and effective in God's work, and to be faithful to the trust that you have given us through your faithful support. Twenty three years ago my family and I moved to the island of Mindoro in the Philippines to serve as missionaries to the Alangan tribe. I was an only child, and had always wanted a sibling. When I arrived in the village of Pandarukan, however, I found a whole village full of brothers and sisters. One particular family took me in, and informally adopted me. I spent every afternoon in their house, and they took care of me when my parents had to travel. You may remember me telling stories about their oldest son, Delpin, whom I think of as my older brother. He has been my best friend almost since the day I arrived, and he now works with me among the Tawbuid. I also grew up with Delpin's sister, Rodelyn. I called her my sister for many years, and we were close friends. Several years ago, our friendship slowly started growing deeper and closer, until we realized that we were more than friends. After several more years of prayer, deliberation, and consultation with those wiser and older than us, we have decided to get married. Rodelyn and I will be married on April 1, 2018, along with her daughter, Ellen-Joy. We will be getting married first in the Philippines. We will also have a second service in the United States when we are able to both visit there. Thank you so much for your prayers and support as Rodelyn, Ellen, and I join our lives in service to God and His people! P.S. Just in case any of you missed it, here is the link to a short video that I made for you about one of our expeditions to a highland village.